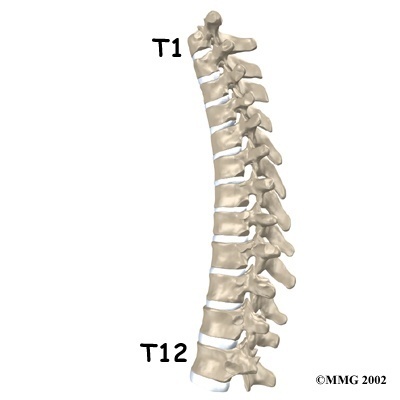 The upper back is the region between the spine and the lower back. It is often the site of pain in a large number of people. The upper back is also connected to the ribs and muscles of the back. Upper back pain can be divided into acute and chronic cases. Acute cases can be related to short-term injury or inflammation to the thoracic spine. Chronic or long-term cases of pain in the upper back may be indicative of damage to nerves or the bones of the spine. Upper back pain is not as common as neck or lower back pain, but can be as distressing and debilitating. Acute cases of upper back pain may be caused by muscle damage. This can be associated with accidents, playing sports, or poor posture. When muscles are damaged, inflammatory molecules are released by the immune system, which cause pain. Inflammation is also caused by conditions such as arthritis, which may also cause damage to thoracic vertebrae (spinal bones), or the ribs. Pain is also associated with damage to the joints between vertebrae in the upper back (known as facet joints). More long-term sources of upper back pain may be disc herniation or bulging. Discs are rings of tissue located between each bone of the spine for support and shock absorption. Bulging occurs if the discs break down and bulge outwards, causing constant pain. The upper back is controlled by the thoracic region of the spinal cord, and by the thoracic spinal nerves leading to it. Damage to these nerves can also cause chronic pain. This can be caused by some cancers in the chest (thoracic cavity) or thoracic spine. Though relatively rare, this can cause chronic upper back pain. 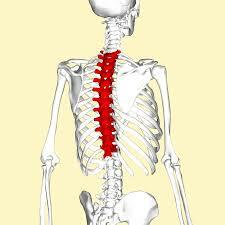 Minor fractures in the bones of the thoracic spine can also result in chronic pain. Fractures are associated with degenerative bone conditions such as bone cancer or osteoporosis. These conditions are associated with advanced age. The first-line treatment for upper back pain is conventional oral painkillers. These include ibuprofen, naproxen, anticonvulsants such as carbamezapine and acetominaphen. The drawbacks of drug use to manage pain are the possibilities of overuse, addiction, and the organ damage associated with prolonged and regular intake. If these prove ineffective, epidural steroid injections may be an option. Steroids inhibit inflammation, so they are often used in treating pain associated with arthritis and other similar conditions. The steroids are delivered through a needle to the spinal nerves that are the source of pain. Chronic upper back pain can also be treated by nerve blocks. These are epidural injections of steroids combined with local anesthetics such as lidocaine. Targeting nerves in thoracic regions, which control pain transmission from the upper back, may be useful in controlling chronic pain. Anesthetic and steroid injections can also be given to the facet joints, or the medial branch nerves that serve them. These procedures have drawbacks; for example, anesthetic injection may cause severe chest discomfort and numbness. In serious cases, cardiac damage may result from nerve blocks in the upper back region. Steroids may also cause side effects, such as mood swings, weight gain, and further risk of arthritis. 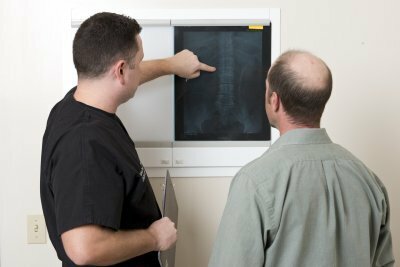 If disc herniation is the source of upper back pain, it can be treated by discectomy. This is a minimally-invasive procedure in which the bulging parts of the disc or discs are removed completely. Discectomy, or percutaneous disc decompression, has shown significant pain relief for up to two years after the procedure. The risks of the procedure are mainly bleeding, infection, and nerve damage after the procedure. Spinal fractures can be repaired by a technique called vertebroplasty. In this procedure, the area of the back above the broken vertebra is anesthetized. A needle is then inserted into the affected vertebra and acrylic cement is injected. This seals the fracture(s). 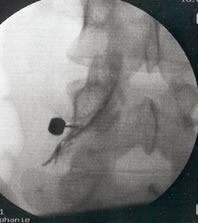 A variation on this procedure is kyphoplasty, in which a small balloon is inserted and inflated to support the bone so that the needle can adequately reach the fracture to be treated. Both are very effective in treating thoracic fractures. They have minimal risks, such as infection and bleeding at the site of needle insertion. There is also a possibility that the cement may “leak” out of the bone, which causes inflammation in the nerves and other surrounding tissue, and thus further pain. Upper back pain is not as common as lower back or neck pain, but can still cause discomfort, reduction in movement and function, and have an impact on quality of life. Acute upper back pain is associated with muscle strain or injury, and is often caused by poor posture, sports, accidents, and inflammation. Chronic pain is associated with conditions such as arthritis, cancer, vertebral fracture, and disc herniation. Acute pain may be treated with oral medications such as acetominaphen and carbamezapine. If the pain persists, a patient can consider procedures such as epidural steroid injections, nerve blocks, or facet joint injections. If chronic pain is a result of fracture(s), this can be corrected by vertebroplasty or kyphoplasty. These are effective treatments for sources of upper back pain in the medium- or long-term. At Nevada Pain our goal is to relieve your upper back pain and improve function to increase your quality of life. Lim JB, Sharma H, MacDuff E, Reece AT. Primary osteosarcoma of the spine a review of 10 cases. Acta orthopaedica Belgica. Aug 2013;79(4):457-462. Reynolds J, Belvadi Y, Kane A, Poulopoulos M. Thoracic disc herniation leads to Anterior Spinal Artery Syndrome. Demonstrated by diffusion weighted magnetic resonance imaging (DWI): A case report and literature review. The Spine Journal. Nov 16 2013. Aydin AL, Sasani M, Erhan B, Sasani H, Ozcan S, Ozer AF. Idiopathic spinal cord herniation at two separate zones of the thoracic spine: the first reported case and literature review. The Spine Journal. Aug 2011;11(8):e9-e14. Soultanis KC, Mavrogenis AF, Starantzis KA, et al. When and how to operate on thoracic and lumbar spine fractures? European Journal of Orthopaedic Surgery & Traumatology. Oct 25 2013. Buy X, Gangi A. Percutaneous treatment of intervertebral disc herniation. Seminars in Interventional Radiology. Jun 2010;27(2):148-159.